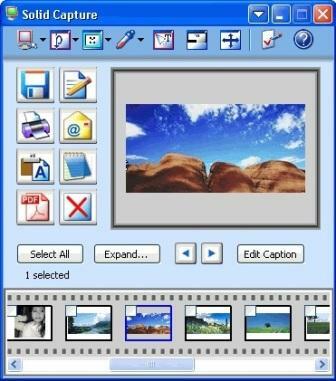 Solid Capture is a screen capture and image sharing software toolkit similar to Techsmith SnagIt that can capture anything on computer screen including drop-down menus, and supports saving, editing, formating, printing, emailing and sharing of image captured. Rectangle Capture with or without resizable frame. Window Capture for whole window, a portion of a window such as menu or toolbar, multiple windows, and drop-down menus, with scrolling windows support. Full Screen to capture entire computer screen with multiple monitors support. Color Capture to capture the color of a part of screen, down to a single pixel to use as palette. Text Capture to extract and copy selected text to clipboard. Window Ruler aka pixel ruler to measure on screen size. Ability to create and save to PDF. All captured images, pictures or photos can be printed, can be saved to one of the following image format: NG, GIF, JPG, TIF, or BMP, can be edited, can be e-mailed instantly, and more. Go to the free Solid Capture registration page at soliddocuments.com. Enter email address and name, and then click Register button. Login to the email’s Inbox for license information such as user name, user email, organization and unlock code. Download and install latest version Solid Capture setup installer. Run Solid Capture, and program will prompt if user would like to evaluate the software for a limited time period, unlock it using unlock code, or purchase an unlock code for it. Select the I already have an unlock code and would like to unlock Solid Capture option, then click Unlock button. Enter name, e-mail, and organization as well as unlock code as received in email in the fields provided and click OK.
Once unlocked, Solid Capture is now a fully licensed software.